What is the difference between a calzone and a stromboli? I looked all over the internet….at least as much as I could before the ADHD kicked in and things quit processing and I got bored. What I did find out is that there is a lot of arguing back and forth with no real definition to be found. 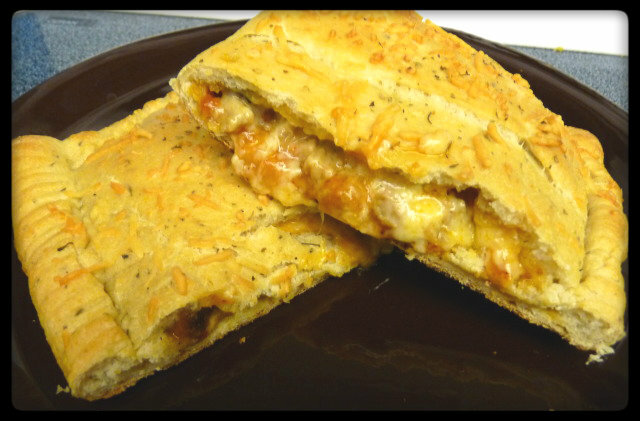 A calzone (which is Italian for Pant Leg, referring to a style of pants worn back in the 18th Century. Aren’t you glad you came here to find that out? Don’t you think you’ll sleep better tonight knowing that?) is folded over and has a crescent shape, much like a turnover, and a stromboli is rolled up into a log shape. That is about where all the agreement stops. Some say one should have a sauce inside it while others say it should be on the side, some say a certain type of cheese should be used in one but not the in the other and many more arguments about what ingredients should or should not be used. Fine. Great. No help at all. I’m going to go ahead and call these calzones because we folded them over (not rolled up) and they have somewhat of a crescent shape….if you use your imagination. Just like when we make pizza, we ended up making two totally different variations. First thing you gotta do is get you some dough. You can use store bought, or from a pizza place, but I like to use the recipe for pizza dough found on The Naked Whiz’s website. It’s a simple one where all you do is dump the ingredients in a bread machine, select the “Dough” option and walk away. On my bread machine, it takes about 90 minutes. The Naked Whiz’s Bread Machine Pizza DoughThis makes enough dough for 2 12-inch pizzas. Place the ingredients in the order listed into your bread machine. Place the machine on the pizza cycle and let her rip! When done, either move to a floured board to use immediately or place in an oiled bowl, cover with plastic wrap and place in your refrigerator until ready to use. 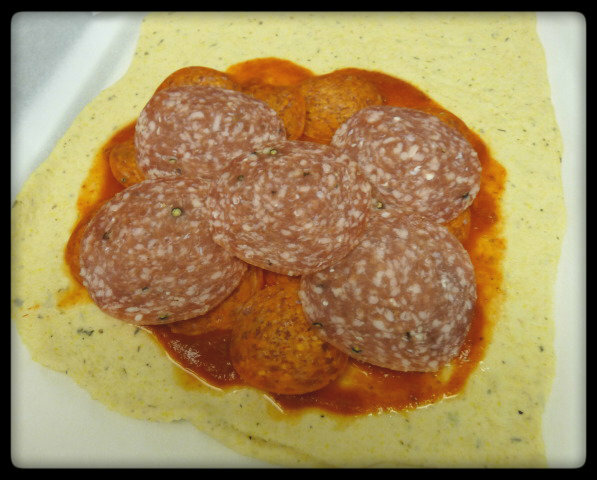 The first calzone started off with some sauce (I don’t want to hear any argument here about whether a sauce should be used of not) and then some pepperoni and salami. Next, Mrs. G added some cheese. Not sure what was added. We were just kind of cleaning out the fridge. 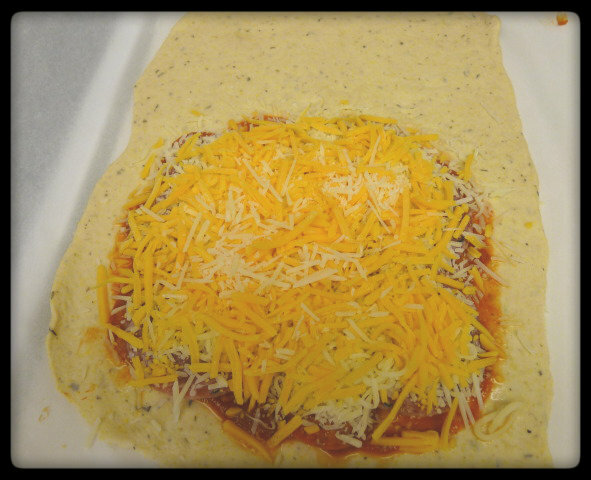 Some mozzarella, some pizza blend, some cheddar and a bit of parmesan, if I am not mistaken. 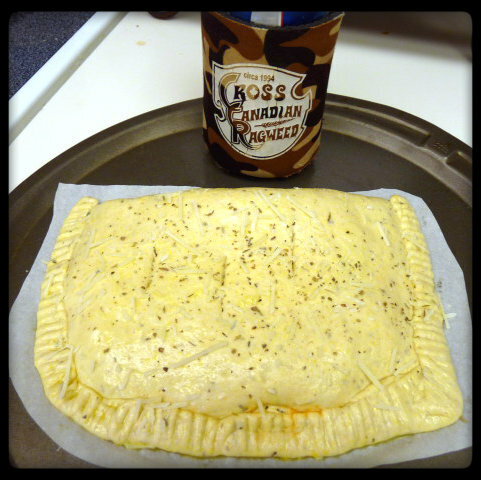 The second calzone was sauced and then topped with leftover tri-tip, diced onions and some horseradish. The cheese used was mozzarella, pepper jack and some parmesan. 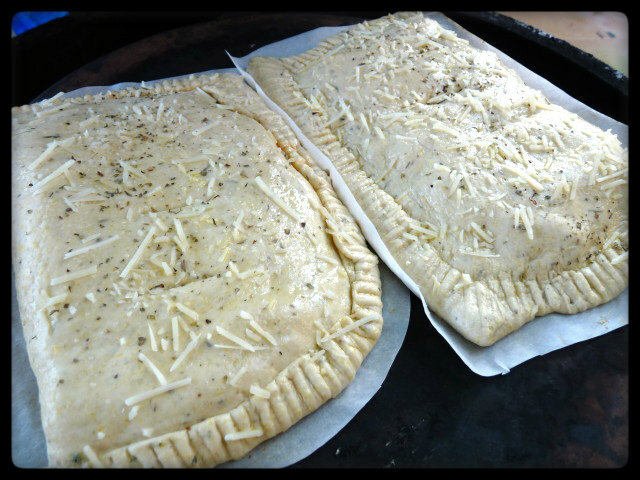 Once the calzones are filled, folded and crimped shut, apply some eggwash (1 egg beaten along with a tsp or 2 of water) and some more parmesan cheese and Italian seasoning if desired. 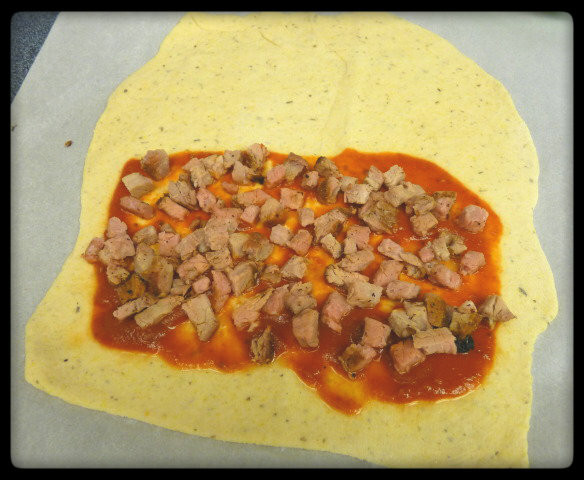 Make sure to cut 2 or 3 slits in the top of the calzone to allow steam to escape. Now that your calzones are ready, let’s focus on the Egg. You want to have your Egg stabilized at 550F with the placesetter legs down, then the three little green feet and then your pizza stone. Make sure to allow about 30 minutes for your pizza stone to come up to temperature before starting your cook. 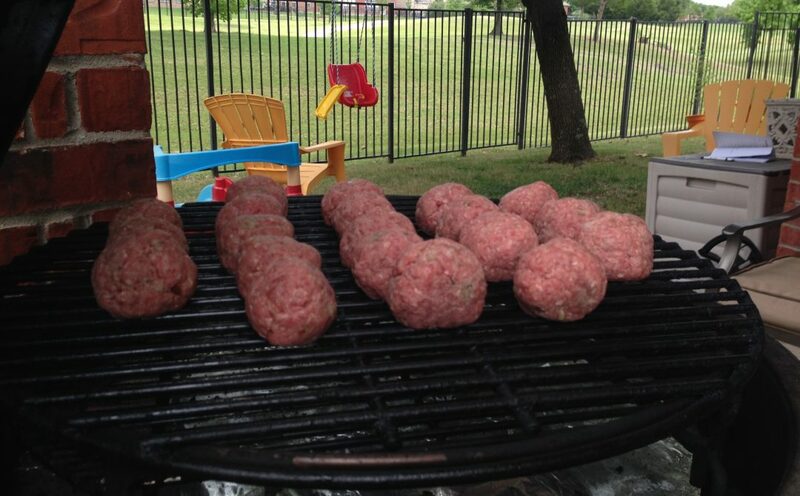 I’m not really sure how you would cook these on a gas grill. 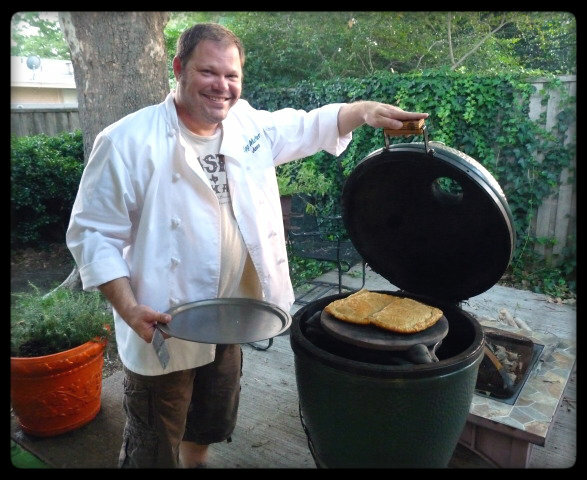 Maybe set up your gas grill and cook them indirect, or use a pizza stone over the lit burners. 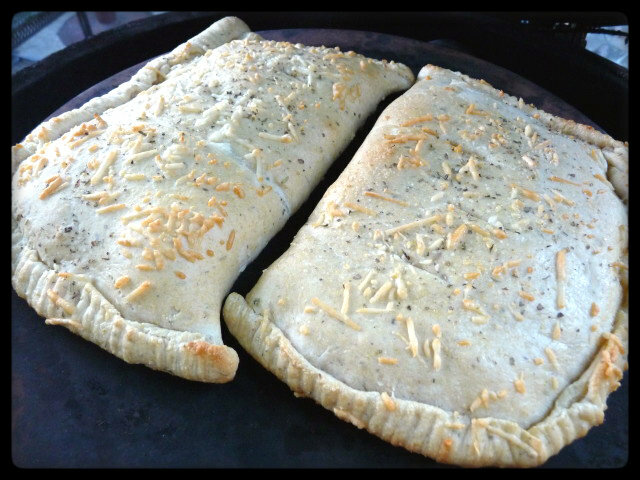 Notice the parchment paper underneath the calzones? This is a little trick I picked up making pizzas. I don’t have a pizza peal and I’ve always had a problem sliding my pizzas off a cutting board onto the Egg. It has resulted in some disasters in the past. 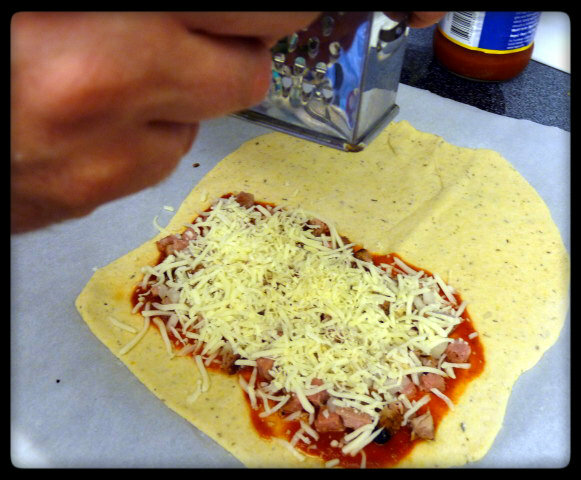 But with parchment paper, you can easily slide them onto your pizza stone. After a few minutes, you will be able to grab an edge of the parchment paper with tongs and it will slide right out from underneath it. Figured I might as well do it with the calzones. The calzones took about 15 minutes to cook up. Might take a few more or a few less, so keep an eye on them and make sure to check the bottom to ensure that they aren’t burning. Once they were done, we let them cool off for a few minutes before slicing them up. Let me tell you….that was a long few minutes. I was dying to cut them up to see how they came out. Mmmmm….look at all that goodness. You know you want a bite of that right about now. They every bit as good as we hoped they would be. Melted cheese, marinara sauce, meat…what’s not to love? I preferred the pepperoni and salami one over the tri-tip, but both were amazing. If we did one thing wrong, though, I think it was not adding enough stuffing. The stuffing to crust ratio wasn’t right. We were a bit cautious, this being our first time, on how much to add, but they could have handled more meat and cheese. I didn’t pick up the onions or horseradish much in the tri-tip calzone. Guess I should have went with more. All in all, I would call this a success and can’t wait to try them again. Hmmm… I wonder what we should put in them next time? Sauce INSIDE. Always. These look amazing! 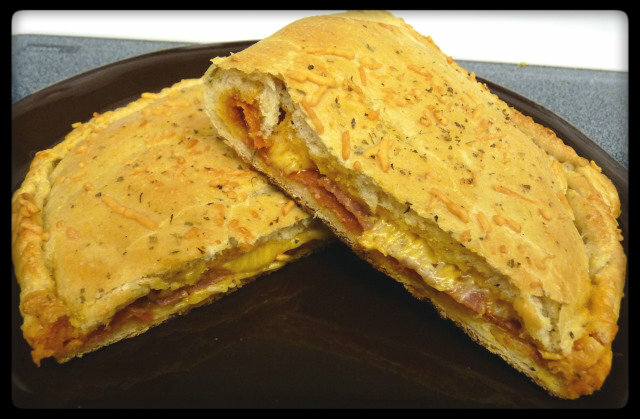 Also, stromboli (in my opinion) can have “non-pizza” things inside. I make a great one with ham and such. But, that’s not pizza-y. So, I call it a stromboli. And no sauce in the stromboli! LOL! CCR! One of Mrs. G’s favorite bands and that was her beer (I don’t think I had switched over from bourbon yet). Pretty fun lil cook. These look soooo good Griffin. In India its really difficult to come by a bread machine, besides we most of us are used to working dough with our hands as we eat a flat bread almost daily called Chapathi. Pizza stones….I’ve never seen one….but now I know whats on my wish list we get to the US on holiday. I’m sure it the recipe could be made by hand. I’ve just started with bread and pizza doughs so I’ve been relying on the bread machine my Grandmother gave me. Need to start trying to do it by hand. Hey Grif, what kind of bread machine do you use? I have no idea. I can take a look when I get home. Something my Grandmother gave me because she wasn’t using it anymore and thought I might. Mmm looks good and comforting! I’ll have to have my bread machine whip up a batch of the Whiz’s dough. Alexis hates it when I refer to her as my bread machine, lol. Delightful! Now when I was a kid, my Nonna would as a treat occasionally make calzone. I’ve always understood them to be inside out pizzas, ie. same dough rolled out the same way and the a filling instead of a topping. Nonna used to DEEP FRY them… wow, and just filled with ham and mozzarella. Great post. I am really impressed by your blog and found it quite interesting. The next time you make calzones try adding some Ricotta cheese. I dust the inside of mine with a combination of salt, black pepper and garlic power. Just a touch. I brush mine with melted butter and hit it with some grated parmiggiano. My hat is offto you for your deep dish pie. I made one using my dough, but your process. It was one of the best I ever cooked and our family was in the business for more than 45 years. Thanks, Sam. That means a lot to me. Where you been hiding? Haven’t seen you much on the forum lately. 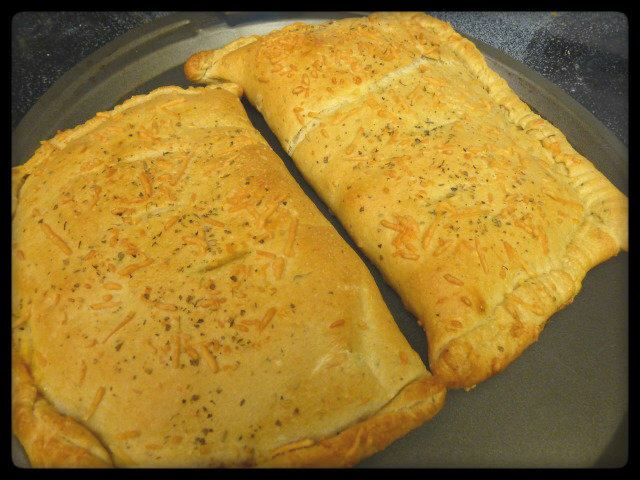 I’ll give your sugestion a try next time I make calzones. Hey Griff, what herbs did you add to the dough mixture (and quantities). The recipe you show doesn’t have herbs but clearly they are there. Thanks! You want me to try and remember something from over a year ago? 😉 I seem to recall adding in Italian Seasoning when I used that dough recipe. No real measurement, just a couple tsp maybe? Maybe a tbsp? Just kind of eyeballed it. The dough is fine without it, I was just trying to spice it up a bit.